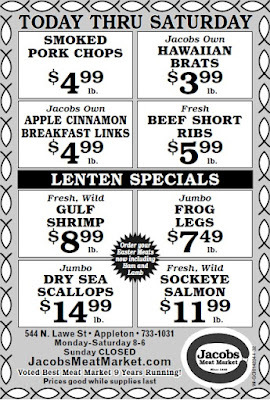 Weekly Specials good 3/20-3/23/2019 or while supplies last! and Hawaiian Brats to Smoked Pork Chops, Jumbo Frog Legs, Jumbo Sea Scallops and Apple Cinnamon Breakfast Links. Great prices on Great items. The skinny man headed for the tree, and in five minutes he was back knocking on the lumberjack's door. "I cut the tree down," said the man. The little man laughed and answered back, "Sure, that's what they call it NOW!"